A 20-foot in diameter horizontal dial at ground level made of concrete. Part of the campus plaza. The gnomon is also concrete, approximately 8 inches wide and 5 foot tall. Place for students of SUNY Binghamton University to congregate. Within the gardens of the museum is a vertical dial constructed as a very colorful wall mural. 12' Bronze 10' Metal dial mounted on marble(?) square atop column. Roman numerals 5AM-7PM. 'Van Schaick Island Golf Club' on dial face above inscription. 'In memory of/ John F. Gaucas/ Who Served as Golf Professional at the/ Van Schaick Island Country Club/ 1944 to 1974' on small granite marker near base of dial. A 13-1/2 foot tall monumental horizontal dial memorial to the victims and responders of the 9/11/2001 World Trade Center terrorist attack. 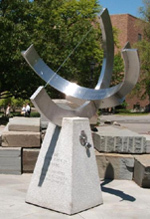 The memorial sundial gnomon is created from an 11000-pound, 14-foot long twisted steel beam once part of the North Tower of the World Trade Center. The gnomon is held at an angle of 41 deg 12 minutes by a 16-ton boulder with inset channel to cradle the twisted steel. This solar alignment sculpture called the "Sun Triangle" is made of polished 1/8 inch stainless steel. Its leaning, 10 foot tall pedestal gives the mounted triangle a futuristic look of monumental size, where the tip of the triangle towers 34 feet above ground level. The selected triangle angles are described by the dial plaque, making solar alignments at noon on the equinoxes and summer/winter solstices. There are no line markings or hour indicators on the ground. However, the pedestal is bolted to a buried concrete block weighing approximately 16 tons. A small brass horizontal dial 9 1/2 inches in diameter. Has a compass rose in the center. Hour lines branching to half hour and quarter hour. Roman numerals showing 5am to 7pm. To the south of the gnomon is a graph of the equation of time. Donated to Colgate University by Fred Sawyer. The dial sits upon a rectangular granite column. 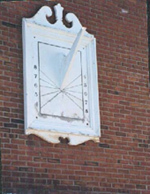 A 16 x 6 foot wood and steel vertical dial on the south wall of the Louis S. Wolk Observatory at the Marion and Max Farash Center for Observational Astronomy. Dial declines 16.3° W of S. Dial displays EDT with longitude correction. Pedestrian and equine access is unrestricted but vehicular traffic is limited to members. This 650 pound equatorial has an adjustment This setup enables the instrument to read clock time. making this a very precise instrument. The gearing rusted in 1980 and was refurbished: "The heart of the sundial's functionality, a roundish steel disc called a cam, was also replaced with a stainless steel, slightly better-functioning one, connected to an hour and minute scale by small, stainless steel cables via a pair of precisely designed pulleys." Thus the mechanical adjustment compensates the sun's irregular motion called the Equation of Time and shows civil not solar time. A horizontal sundial made from a slab of stone approximately 18 x 24 inches. The hour markings are inscribed in the form of an arrow pointing to the 12 o'clock hour. The gnomon is a thin blade. The dial was made in 1976 by Michael Sweeney. In keeping with the herb garden's design, Sweeney used native materials of stone for the dial and pedestal. The dial base is a prized antique millstone from a nearby village. A bronze circular horizontal dial about 18 inches in diameter. At the edge of the dial set in concentric rings are the hour lines, half hour lines, quarter hour and five minute marks. Hours are in Roman numerals from 5am to 7pm. Has a thick brass gnomon. A cornfield maze for the summer of 2000 at Long Acre Farms. Theme called "Lost in Time" features a number of sundials. The 400 x 500 foot cornfield maze, called the "largest living sundial", is in the form of a smiling sun with 12 corn hedge "rays" from 8 am to 6 pm that align in azimuth to the hour and half hour for Labor Day, 2000. Within each hedge is a vertical pole holding an "Eye of Kala" (an annulus) 12 feet above the ground that casts a spot of light across a hedge clearing at the appointed time to a sign at ground level. At the center of the maze is a horizontal dial with a 12-foot gnomon. This gnomon forms part of the smiling sun's nose when seen from the air. Just outside the corn hinge is an analemmatic sundial for visitors to tell time before going through the hinge. In the hinge, visitors are given a small altitude card dial that tells Eastern Daylight Time from June - Oct. Admission fee. A beautiful bronze dial approximately 12 inches long in the shape of a shield. Below the gnomon is a rising sun. On first look, the small dial plate appears backward, with AM and PM hours reversed. 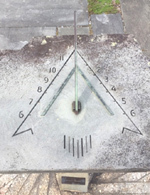 However, the inclination of the gnomon is about 48 degrees, suggesting that this pedestal mounted dial is really meant to be a south facing vertical dial! The dial sits atop a circular granite pedestal about 2.5 feet in diameter. A large vertical dial declining east approximately 45? and displaying fanciful furniture. Hour lines are present but are difficult to see; hour numerals are not shown. Summer and winter solstice lines are shown with the winter solstice line near the gnomon foot because of the declination. The curved line shown for the equinox should be straight. Six individual "Cultural Arcs" are positioned at specific time points on the dial face and are accompanied by upstanding dial furniture. Each "Cultural Arc" references distinct and in some cases overlapping cultural traditions and is made from 1/2" sheet aluminum, with a permanent (powder coated) color finish. Each "Cultural Arc" contains symbolic and aesthetic elements reflecting the ebb and flow of migration in the local East Harlem population. A cast bronze horizontal dial approximately 30 inches diameter. The dial face includes the motto, astrological symbols of the ecliptic with Roman numerals. The 40-inch high cast pedestal sculpture depicts the three muses supporting the dial. This dial is visible from the street in front of the residence. A granite park bench about 30 feet diameter whose bench shelf was designed to cast a shadow indicating time on the equinoxes. Individual curved lines corresponding to the bench shadows mark 10AM, Noon and 2PM. Known as the Waldo Hutchins Bench, the bench includes a second hemicyclium dial above its backrest; refer to Dial 250. Dial alignment may not be accurate. 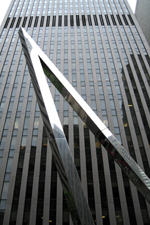 The Sun Triangle is a 50-foot sculpture of polished stainless steel set upon a leaning 20-foot stainless steel pole, creating a futuristic look. The sides of the triangle are aligned such that steepest side points to the sun at noon for the summer solstice at an altitude of 73 degrees at solar noon (12:48pm Daylight Saving Time) while the lower side of the triangle points to the winter solstice at an angle of 26 degrees. The upper side and longest side of the triangle points to the the noonday sun on the spring and fall equinoxes. A 20' H x 10' W x 5' D Equatorial in Bronze and Stainless Steel. Entitled "Song to the Sun." Dial by Robert Adzema; gift of George and Annette Murphy in 1984. 3 x 4 feet bronze vertical declining S 28° W, 30 feet above the street level. The armillary dial is 30 inches in diameter, built of bronze with a cast stone pedestal. On the outside of equatorial band are golden zodiac signs. Inside the band are roman numerals for hours from 6 am to 6 pm. The dial was vandalized but was refurbished in 2000 and moved a short distance in Parks Dept. renovation. Sal Ton Landscape was the general contractor; Kenneth Lynch & Sons repaired the sundial and made a complete new cast stone fluded base in 2000. A 10 inch diameter rough brass horizontal dial, painted brown, on a 3 foot cement pedestal. Gnomon is damaged. Roman hour numerals. Dial sits atop a cast stone pedestal about 3 feet high. Granite model of old roman hemicyclium dial with beautiful horizontal bronze gnomon with figure of woman. Hour and date lines may be incorrect. Slightly vandalized and chipped. This dial is a detail of a larger park bench that itself was designed to show time on the equinoxes; refer to Dial 614. The park bench alignment is nominally north but this dial may be misaligned as the Roman hour numbers inscribed on the face run clockwise, incorrect for a south-facing dial. Dial sits atop a large stone park bench. An 11 inch diameter bronze horizontal dial on a 3 foot pedestal. Tip of gnomon is broken. Sheet Metal Octagonal. Built by a prisoner. Clipping in envelope #250. An equatorial dial in bronze. Has analemma at the noon hour mark. Lamont-Doherty Sundial Fountain. This south facing vertical dial is 4x2 feet made of concrete, now slightly brown with age. The graceful gnomon is white-painted metal. Hour numbers in Roman numerals extend from 6am to 6pm without further delineation. This old vertical north facing dial in on the Spring House, constructed circa 1822. The building was an old Erie Canal Inn. The dial is about 48 inches high by 30 inches wide, made of wood and painted with a white boarder. The gnomon is also white painted wood and "looks upside down" because the dial faces north. The dial and gnomon have been repainted several times. 17' H x 11' W x 8' D Painted steel with stainless steel wire cloth Noon mark and analemma features made of concrete and brass. Small horizontal brass dial, about 12 inches in diameter with classical design. Roman numerals for hours with dots for quarter and half hours. Sits on fluted column about 3 foot high. Beautifully set in the Shakespeare Garden. A 6 foot diameter bronze sculpture reclined 50° (latitude is 40° 45' N) with slit gnomon and hour marks. Gift of Joan and Richard Scheuer in 2000. More sculpture than sundial, it does have some hour marks but reclines and appears to be out-of-plane. A 20 foot high x 15 foot wide x 4 foot deep painted aluminum vertical dial entitled '"Winged Shadows." Has declination lines for the solstices and equinoxes. Declines west. On the back wall of the Main Building. Can be viewed from Woodside Ave. Designed by Robert Adzema in 1987. A vertical dial on the cupola above the main entrance. Declination 70° 12' 04" E. Painted all white so that no hour lines can be seen. Paul Manship was commissioned to make the sundial for the 1939 World's Fair in New York. The dial was named "Time and the Fates of Man." Manship wrote, "The Perisphere and Trylon at the World's Fair suggests to me measurements of time and space, so my sundial… relates to the background of the central motif of the Fair." His white plaster sculpture was the biggest sundial in the world, standing 80 feet tall. A large 40 foot equatorial dial. The dial band is about 5 feet wide with raised Roman numerals at each hour mark. The gnomon is a rod approximately 15 feet long, ingeniously suspended by wires at the center of the dial. No shadow of the support wires can be seen, just the line of the gnomon appears on the dial band. A marble horizontal dial on marble sculpture pedestal. The original bronze Treble Cleft gnomon is now missing. A horizontal dial 43 feet in diameter, built on a raised circle flower bed raised about 3 feet above the ground. Outside the raised circle the hours are shown by roman numbers are embedded in the walkway. 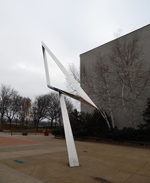 The metal gnomon is approximately 20 feet above ground and is centered in the raised flower bed. 7-sided metal plate, about 9.75" on a side. Bronze. Unusual 7-sided dial plate, Arabic numerals. Hour and half-hour marks on outside rim. Image of bible and cross on plate left of gnomon, and 'Word of Life' on right. (These are the standard logo of the organization.) Fabricated by Colonial Brass Co, Middleboro MA. This bronze dial measures 22 inches in diameter, with the gnomon tip 10 inches above the marble dial plate. Hours are marked by Roman numerals, half hours by tics. Dial stis atop a stone and cement base. Robert Adzema has designed a 10-foot tall, 12-foot long combination equatorial and horizontal dial made out of stainless steel. The equatorial dial has a wide arc showing hours from 6am to 6pm. At the noon hour is a 31-inch analemma illuminated by a 1/4-inch nodus in a rod gnomon. The pedestal holding the dial and rod is designed as the gnomon for an even larger horizontal ground level dial that surrounds the equatorial dial. For this horizontal dial, the hour lines are made of half-inch stainless steel bars are embedded in concrete. An inscription tells how to tell the time. A 10 foot 2 inch diameter armillary sundial made of steel. The dial weighs about 8000 lbs. The vertical dial is on one face of a ornamental rectangular display raised on pole at the edge of the street at Key Bank Clock Plaza. The dial is approximately 2-foot square with an ornate gnomon having a "key" cutout. The dial was moved from another location to the present pole and restored. The dial is made of copper or bronze. Nearby is a plaque with the equation of time. Dedicated May 15, 1967. A simple horizontal dial made of slate with a copper gnomon. Hour lines are brass rods artfully arranged from 6am to 6pm. The hour lines are corrected for longitude.